Lizard Island, Australia’s northernmost island resort on the Great Barrier Reef, is truly secluded from the rest of the world and is located a one hour scenic flight over the reef from Cairns. With only one resort on the island hosting 40 rooms, it is the tranquillity and natural beauty of the island that will first greet you. 24 pristine powdery-white private beaches - literally means you can have a beach to yourself. Snorkelling straight off the beach where clam gardens, coral and marine life are abundant and diving on the inner and outer reef to some of the world’s most famous dive sites. The food philosophy is simple and embraces local, fresh produce taking inspiration from Modern Australian, European and Asian cuisines. Enjoy the daily changing menu paired with a fine selection of wine at Saltwater restaurant which has breathtaking views sweeping over Anchor Bay. Treat yourself to a gourmet picnic lunch on a secluded beach and a sunset beachside degustation dinner for two. Indulge in a luxurious treatment at Essentia Day Spa or have a go at some world class fishing. 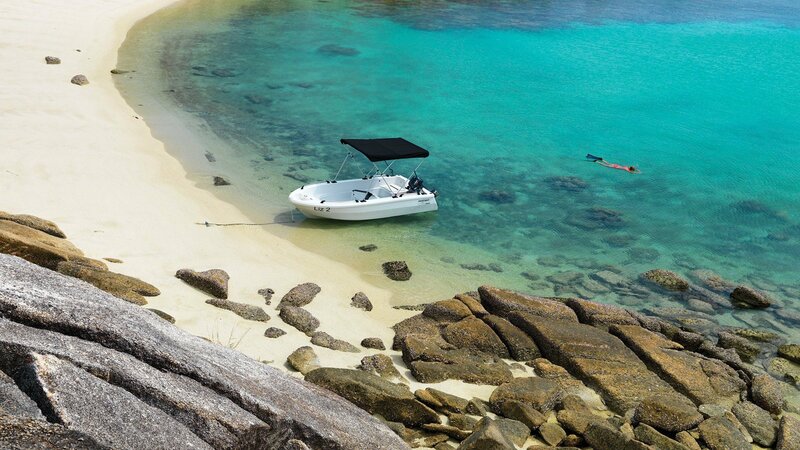 Lizard Island has something for everyone – it is truly like nowhere else.